Lake Metigoshe is located along the U.S./Canadian border, 14 miles northeast of Bottineau, ND. Every year the local Lions Club hosts a contest to guess when the 'Can' will fall completely through the ice. You can learn more about the contest here! Tickets are on sale from January 1st through April 1st of each year. If you are visiting Bottineau & Lake Metigoshe, tickets can be purchased from most local businesses. Tickets can also be purchased from Lake Metigoshe Lions Club Members. If you live in an area where tickets are not available, you can complete a "Ticket Request Form" and mail this form, along with payment to the Lake Metigoshe Lions, P.O. Box 5, Bottineau, ND 58318. This form and payment will reserve your tickets. A confirmation of your entry will be e-mailed or messaged to you. NOTE! MAILING SERVICES ARE FOR PEOPLE THAT LIVE IN AREAS WHERE TICKETS & BROCHURES ARE NOT AVAILABLE. In order to participate you can mail your list of guesses along with $2.50 per guess to the Lake Metigoshe Lions Club, and we will gladly fill out the tickets for you. Be sure to include a phone number so we may contact you should we have any questions. Click here for a "Ticket Request Form" showing what information you will need to send us to complete your tickets. If you are interested in entering a group of people as a "Pool" see below "How To Enter As A Pool". We do not accept credit cards, so payment may be made with a money order, cashiers check or personal check made payable to the Lake Metigoshe Lions Club. We do not recommend you send cash through the mail. The deadline to mail your guesses is April 1, 2019; the envelope must be postmarked on or before April 1, 2019. Mail your list of guesses along with $2.50 per guess to: Lake Metigoshe Lions Club, P.O. Box 5, Bottineau, ND 58318. You need a Pool name; example of a Pool name, "Grandma's Kids Pool". We need a list of names for every person in the Pool. The Pool name, address and phone number should be the same and entered on every ticket. Labels and stamps may be used. Put the month, the day, the hour, the minute and circle either A.M. or P.M. for your guesses on all tickets. Make sure all tickets are completed with the necessary information. 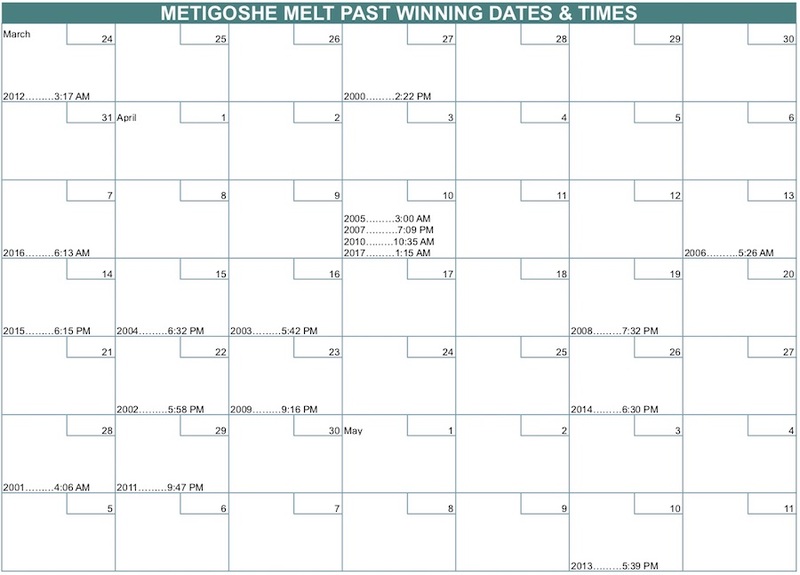 Pool tickets and the list of Pool members must be mailed to the Lake Metigoshe Lions Club with a postmark on or before April 1, 2019. For your records, make a copy of your list of Pool members and the completed tickets.